North Korea has multiple reasons for acquiring nuclear weapons. They provide the regime with international status, create a useful tool for extortion and cement military loyalty to the Kim dynasty. North Koreans complain they have faced American nuclear threats going back to the 1950s and cite ongoing threats, which included bomber overflights and annual military exercises conducted by American and South Korean forces. President Trump has borrowed from the playbook of the four presidents before him who tried, with differing mixes of negotiations, sanctions and threats to force the North to give up its nuclear programs. But the June summit was historic. No North Korean leader has ever met an American president as an equal. For Mr. Kim, that achievement alone will give the 34-year-old leader incalculable prestige. For his part, Mr. Trump saw the meeting as an opportunity to use his dealmaker's skills and personal connection to bridge gaps that his predecessors could not close. The threat has been reduced, but not eliminated. The North Koreans have stopped missile and nuclear tests in recent months, but there's no evidence that they are decreasing nuclear stockpiles, or that they have stopped production of nuclear materials. To update the outcomes of the June summit and the prospects for a future summit that President Trump has said he plans, as well as to assess the problems he will face with reaching and implementing an agreement with the North Koreans we welcome a veteran negotiator and experienced diplomat, Ambassador Christopher Hill. Ambassador Hill is the Chief Advisor to the Chancellor for Global Engagement and Professor of the Practice in Diplomacy at the University of Denver. He is a former career diplomat, a four-time ambassador, nominated by three presidents, whose last post was as Ambassador to Iraq. 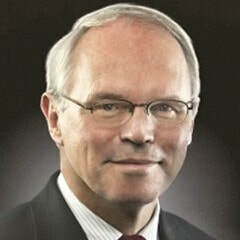 Prior to Iraq, Hill served as Assistant Secretary of State for East Asian and Pacific Affairs from 2005 until 2009 during which he was also the head of the U.S. delegation to the Six Party Talks on the North Korean nuclear issue. Earlier, he was the U.S. Ambassador to the Republic of Korea. Previously he served as U.S. Ambassador to Poland, Ambassador to the Republic of Macedonia and Special Envoy to Kosovo. He also served as a Special Assistant to the President and a Senior Director on the staff of the National Security Council. Ambassador Hill graduated from Bowdoin College in Brunswick, Maine with a B.A. in Economics and a Master's degree from the Naval War College.